After a long and successful partnership with one of the biggest names in Australian cricket, Mark Taylor, seasonal appliance brand Fujitsu General has announced a foray into new sporting codes with two sponsorship deals targeted at increasing its exposure in 2014. The brand has announced a two-year sponsorship deal as sleeve sponsors for the South Sydney Rabbitohs NRL club, a move that will see the Fujitsu logo adorning the arms of Souths players for all its games in the 2014 and 2015 seasons. Football, both NRL and AFL, are sports for everyone. This reach greatly appeals to Fujitsu to help stay top of mind and reach its target audience more effectively. South Sydney Rabbitohs has had an exceptional few years rebuilding its position in the NRL. The dedication of management behind the growth of the Club contributed to the decision to move forward with this partnership. Fujitsu believes both on and off the field, 2014 will be one of South Sydney’s — and Fujitsu General’s — best ever years. The sponsorship deal should hopefully pay dividends for Fujitsu — after a disappointing start to the new millennium, the century-old club has made it to the preliminary NRL finals for the past two years. No doubt Fujitsu and Souths will both be wanting to make it third time lucky. The NRL sponsorship follows a similar decision by Fujitsu to sponsor Essendon Football Club in the AFL for the next four years, a “new direction” for the brand according to Cheah. Similar to the Rabbitohs, Essendon is the most-watched team in the AFL in terms of TV audience numbers, bringing Fujitsu’s exposure to an even broader audience. 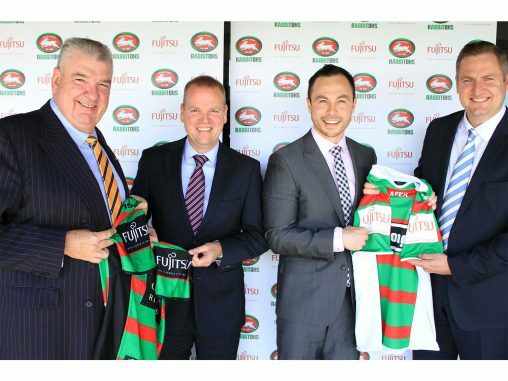 Fujitsu General unites with South Sydney Rabbitohs (left to right): Shane Richardson, South Sydney Football Club CEO; Philip Perham, Fujitsu General deputy managing director; Marc Cheah, Fujitsu General national marketing manager; John Richardson, South Sydney Football Club chief commercial officer.